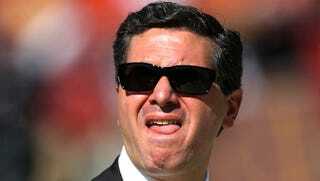 Here's your daily link to Dave McKenna's brilliant "Cranky Redskins Fan's Guide to Dan Snyder," which we'll be posting until a judge goes all Agent Orange on Dan "Daniel" Snyder's libel suit. Snyder partisans aren't buying the hyperbole defense. "It may seem that way to you but didn't seem that way to a lot of other people and it didn't seem that way to us," says Glaser. When asked whether she'd lined up people who'll testify that they read the "Agent Orange" passage literally, Glaser responded, "I'm not going to discuss what my work product is." She further stated: "A reasonable person would believe that he used Agent Orange or a like chemical in connection with his destruction of foliage and that couldn't be further from the truth." Team Snyder just never stops covering itself in stupid, does it? You can donate to the City Paper's legal defense fund here.